From left, Ashley Ojala, Erich Swartz, Summit County Commissioner Thomas Davidson, Blake Shutler, Scott Vargo and Commissioner Karin Stiegelmeier break ground on the second phase of the West Hills workforce housing project Monday at Keystone. 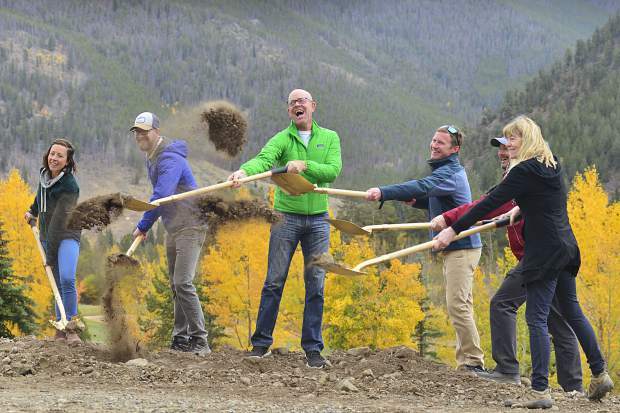 The newest addition to Summit County’s workforce housing inventory was unveiled on Monday, as the county and West Hills LLC held a ceremonial groundbreaking ceremony for West Hills Phase II, a 41-unit development in Keystone. Commissioners Karn Stiegelmeier and Thomas Davidson were on hand to celebrate the milestone. The development will add eight three-bedroom townhomes, six two-bedroom townhomes and 27 two-bedroom condos to the county’s existing workforce housing stock. The units are priced to be affordable to workers earning 70 to 110 percent of area median income (AMI). According to a county press release, sale prices for West Hills Phase II townhomes and condos range from $212,126 for the lowest-AMI two-bedroom condos to $441,149 for the highest-AMI three-bedroom townhomes. The maximum total gross income for the two-bedroom townhomes ranges from $97,920 to $106,080; maximum income for the three-bedroom townhome units is $122,525; and maximum income for the two-bedroom condominiums ranges from $73,440 to $89,760. To find out what percentage of Summit County AMI your household falls into, visit the Summit Combined Housing Authority website at SummitHousing.US. Erich Swartz and Ashley Ojala, homeowners in West Hills Phase I, were also on hand to celebrate the groundbreaking and spoke about their positive experience becoming homeowners in Summit County. But the astronomical housing prices kept the couple solidly shut out, until they were able to buy a workforce unit in West Hills Phase I.
Ojala said that she hopes her experience provides other Summit workers with hope during their own housing searches. “I’d like to encourage Summit County residents to look into Summit County programs that exist and apply, and to know that there are opportunities for them,” Ojala said. Summit Combined Housing Authority will begin accepting applications from prospective West Hills Phase II buyers on Oct. 2, with an application deadline at noon on Nov. 2. Eligible applicants who work an average of at least 30 hours per week each year in the region between Arapahoe Basin Ski Area and the eastern shore of Dillon Reservoir will receive priority consideration in the lottery. The first of the 25 completed units will likely be available in summer 2019, with all units completed by the end of the year.